Thousands of Qatar residents have been struggling to use VoIP (Voice over Internet Protocol) services like Skype, Facetime and Whatsapp over the past few weeks. The cause of the problem remains a mystery. While residents await clarification about what’s going on, some have been circumventing VoIP problems by using a VPN. VPNs (virtual private networks) allow you to encrypt your internet activity, and disguise your physical location. Unlike in the UAE, VPNs are not illegal in Qatar, as long as you don’t use them for activities that break the country’s laws. Some Qatar residents already use VPNs to access country-specific TV and movie streaming services and local news websites. They are now finding that popular VoIP services work when a VPN is used on their PCs, phones and tablets. Some VPNs are free and others charge a fee. Here’s a list of some of the most popular ones. Notably however, some Qatar users have complained lately about trouble with their VPN services, so you may have to try a few before one works. Even though Whatsapp etc are not working, some VoIP apps appear to be holding up well at the moment. The first is Google Duo, Google’s encrypted video chat app. 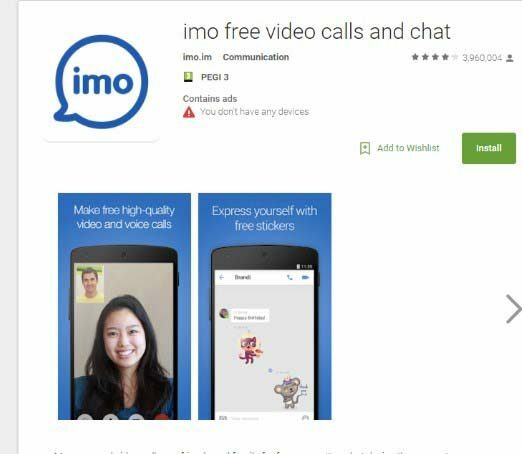 VoIP app IMO is also available for Apple and Android, and so far, our readers say it’s working for them in Qatar. I second that 👌🏻 The best audio quality you can get now. Reviews on the Google Play store are a bit mixed, however – with some saying that connections can be a bit iffy. Let us know if this encrypted service works for you. The popular messaging app Telegram introduced voice calls earlier this year, and readers report that this service still seems to be working. You can’t make live video calls with it, but you can send video messages instead. Telegram promises to be “fast, simple and free” and the encrypted service also allows you to create massive group chats, should you wish. People began complaining about the outages shortly before Eid. So far, Qatar’s two telecom companies Ooredoo and Vodafone, as well as official government sources, have not shed any light on the problem. This has been frustrating for the many Qatar residents who rely on VoIP as a cost-effective, instant and reassuring way to keep in touch with loved ones abroad. How are these services working for you? Thoughts? After nine days of outages, Vodafone Qatar is now completely back online and has launched a compensation scheme for customers. In a statement today, the telecom provider thanked users for their “loyalty,” apologized for the disruption and announced a new You First program. The scheme offers both post- and pre-paid customers free data, and traveling Vodafone Passport holders a full refund. On July 17, the company’s network went down, causing a loss of voice and data services for nearly two days. The company said this had been caused by “technical issues” while carrying out upgrade work to its systems. Over the course of the next week, services were slowly restored, first 2G and then 3G. Finally yesterday, its entire network, including 4G, was back up and running. Vodafone said active users of its Postpaid services will get a one-off compensation of 30 percent of next month’s bill. They will also receive 6GB free a month for the next three months. Existing Prepaid customers will receive 500 Flex for free for five days, and this can be used for local or international calls, data or SMSs. “Flex will be added to Prepaid customers in batches within the next 2 weeks. Customers will receive an SMS with the date of when the benefit will be added to their account,” Vodafone said in an online statement detailing the compensation arrangements. Postpaid customers will also be compensated automatically. Meanwhile, users who were traveling overseas during the outage, and who had activated a Passport pack will be refunded for the value of the roaming pack. The failure of services was met with frustration and anger by many of Vodafone Qatar’s 1.5 million customers. Some were particularly riled by the company’s initial lack of communication as the outage happened. Gray issued a video statement last Tuesday, as the outage was into its second day, apologizing to customers for the disruption and admitting that the network and its backup had both failed following an upgrade. The telecom provider flew in parts from across the world and collaborated with technicians internationally to fix the issue, he said. Qatar’s telecoms watchdog, the Communications Regulatory Authority (CRA), called on Vodafone Qatar to issue a full report on the incident by July 20, including what steps it has put in place to avoid similar outages in future. The details of this have yet to be publicly revealed. Were you affected by the Vodafone Qatar outage? Thoughts?